This blog isn’t about sustainability. It’s about decision-making – and especially framing. But I need to quickly explain something first. My background in sustainability makes me alert to issues around consumption. Why? Because the resource use required for the levels of consumption we have is literally unsustainable if humans are to carry on thriving. And also because increased consumption goes hand-in-hand with a host of problems including inequality, crime and mental illness, as our lives become ever more about the status that consumption signifies. So it’s no surprise that I have a problem with the frequency with which people are described as ‘consumers’, rather than as residents, citizens or, erm, “people”. It happens a lot, and it annoys me, because there is so much more to us than what we buy and use. I think we can now see a demonstrable problem with the way the word (and concept) frames debate and decision making. This might interest you even if you don’t give a monkeys about resource use or wellbeing. 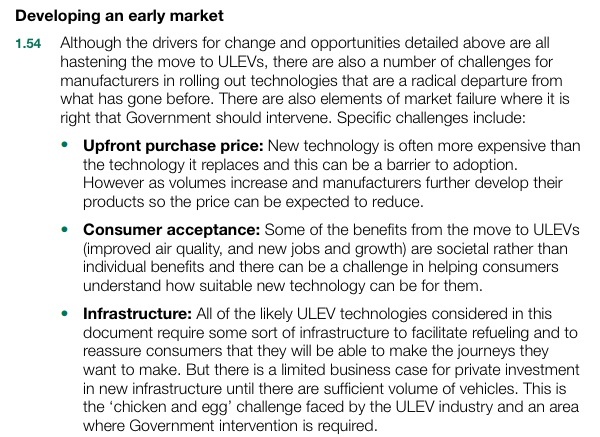 Its’ from the recent Government strategy on ultra low emission vehicles (which doesn’t include bicycles, I should point out). This screengrab on developing the market is telling, I think. Note how people are referred to as consumers; in the Strategy, this happens nearly as often as people referred to as ‘drivers’. Is it possible that this is affecting the way policy is framed? When we have a decision-making class that has unquestioningly pursued GDP growth for decades, this framing makes a positive outcome more likely. “Consumers” consume; and when you’re chasing growth, this is good. The commitment made in this strategy is considerable: £500m six years infrastructural investment, from 2015-2020, and an office has been established at DfT dealing solely with low-emission vehicles. Cyclists (and potential cyclists, which is the vast majority of people), however, get a much poorer deal from decision-makers, who never refer to them, in the act of travelling, as consumers (the Government’s recent policy document on cycling doesn’t use the word once). So it’s no surprise that, even though this was seen by Government as something to trumpet, cycling is receiving a (imho) laughably small investment of £148m (some of which is local funding) – with no commitment beyond two years, despite the existing legacy of next to no investment. This matters, because active travel (walking and cycling) offers an major benefit to the economy and to public health. It would address many of the UK’s deep-seated problems. But it remains marginalised in policy terms, blighted by poor design and assumptions about the primacy of motorised vehicles. The result is that cycling is not easy or normal; despite the hype, there is no cycling boom. I don’t suppose we’d ever be able to run a real-world experiment where policy discussions are restricted to referring to individuals as ‘people’, extended to ‘people who … [cycle/drive/ buy things, etc]. If we could, the outcomes would be interesting. In the meantime, if you want to influence decision-makers, keep talking about consumers. Below is a post I wrote for the Behavioural Design Lab a short time ago. The aspect that has attracted the most interest is the use of proposed use of defaults to move from a project management-centric view (where residents make a fresh decision at each stage of the process that has been mapped out) to a citizen-centric approach (where, once someone has chosen to have a warm home, the default is that they are taking part. Two quick points, drawing on conversations that I’ve had with people since writing this. First, this is a really good litmus test for whether we are comfortable using behavioural insights. Personally, my view is that our choices always have a context, and that framing the choice in this way makes it clear and easier to make a decision that is salient to the person making it. But I know that some people not used to working with behavioural insights are a little uncomfortable with it; because it seems a little, well, sneaky. In a world where there are numerous websites on which I can click a ‘buy now’ button, before verifying a host of details, I’m comfortable with it, and that’s why I see it as a litmus test: it only seems sneaky if you compare it with a context in which people have to repeatedly decide. Second, reflecting that most of the feedback I’ve had has been of the “what a great idea!” variety, there is so much that we can do better in public services, and it is within our grasp. I hope that this helps demonstrate the value of what I’ve been trying to do with With The Grain over the past couple of years. There are so many behavioural effects that we know can affect our decisions; and there is an ever-growing body of evidence of how and when they work. So let’s generate new approaches drawing on this knowledge. This idea was generated in a workshop of stakeholders brainstorming ideas based on different effects, of which defaults was one. Most of them hadn’t been exposed to much behavioural science before; if they can do it, so can you. This is one of our best chances of meeting the demand management challenge. So said a dozen or so stakeholders of a project aimed at retrofitting 160 draughty homes in Crawley, West Sussex. With good reason. They had co-produced a wide-ranging set of design and communication ideas for the project. The project offers work such as external wall cladding, funded by the Energy Companies Obligation, through which the Government is obliging utilities to fund energy efficiency work on Britain’s coldest, draughtiest and most energy inefficient homes. The problem many have found is that, in the absence of existing demand (that is, people who are aware that they want their home retrofitted but haven’t been able to do it yet), building demand for something free is tricky. Price perception tells us that if something is free, it doesn’t have value. Homo economimus might see free cladding as a no-brainer; real people don’t. So, when introducing the opportunity to people, we decided to frame the choice as being between a cold home and a warm home – not as the chance to choose a named process or product. And we avoided terms (such as ‘retrofitting’), known by professionals but which may provide a barrier if not familiar to residents. Adding the use of behavioural insights to the team’s existing expertise in community engagement had a major impact immediately, speeding up recruitment 4-fold, compared with similar projects being undertaken elsewhere in the South East. Another innovation is that, when people say ‘yes’ to a warmer home, this becomes the default setting. So, instead of initially agreeing to an “assessment” which leads to another choice once the surveyor has visited, householders make a single choice: the surveyor will make a recommendation of the measures to adopt “ … unless you drop out”. From a project management viewpoint, we’re moving from a process whose success depends on people saying ‘yes’ at several different stages to a process designed to support and prove people’s positive choice to have a warmer home. There are a dozen other ways in which we are using – or plan to use – behavioural insights. Rob Bennett, who leads the community engagement team, says, “It is really important that we find ways to encourage communities as a whole to get behind these initiatives, So whether it’s the initial decision to participate in a scheme, or ensuring that residents communicate what works best by sharing good practice and experiences – we expect behavioural evidence to play a critical part in successful ”delivery”. We think we’ve learned what the With The Grain tool has also demonstrated in other settings: that behavioural insights are accessible and usable; that these insights help make approaches more people-centric and therefore more efficient; and that it’s possible to get away from the default setting of trying to persuade people. So we now have a platform for using behavioural insights in the future. And we have a group of stakeholders who are comfortable with knowingly using behavioural insights to affect the context within which people make decisions. In the future, this won’t be unusual. Right now, it feels revolutionary. I Have a Dream: an update? It’s so obviously right, that you can’t really imagine someone calling it into question. And yet … what is ‘the content of [someone’s] character’? We now know (and largely didn’t in MLK’s day) that we humans fall prey to, for example, fundamental attribution error very easily. It shapes how we feel about people and is so well understood you can even buy the t-shirt. In brief: because we don’t recognise the extent to which our own – and others’ – behaviour is context dependent, we tend to over-attribute personality traits to others based on what we notice them doing. So my suggestion is that we want to be judged by what we do rather than by the ‘content of [our] character’ since, though our perception of events is biased, surely we can get a better handle on the former than the latter. To illustrate what I mean – what’s more important: that someone identifies discrimination and acts to prevent it (which are behaviours), or that (as a character trait) they are opposed to discrimination? The first, surely. Further ahead, what I hope will happen is that public understanding of our behavioural and perceptual biases, and of context dependency, increases to the extent that we can all be better at interpreting people. We’d have better relationships. And we’d do politics better. I’m not going to rewrite King’s speech. It’s beautiful. But I do wonder if, given what we now know, we can have a dream about mass understanding of behavioural insights.